Josh Niland, of Sydney seafood Saint Peter, sticks to his gill-to-tail philosophy with this Boxing Day sandwich. 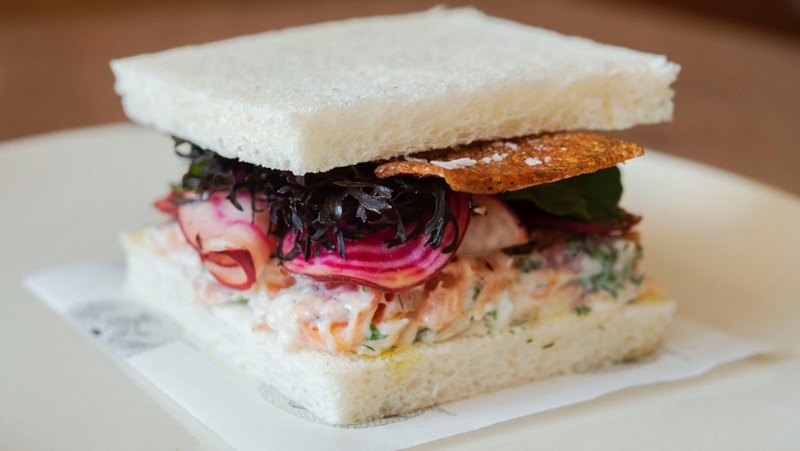 He recommends saving the skin from the Christmas Day salmon to add crunch to this salmon sandwich, which relies on good quality hot-smoked salmon, bread and mayonnaise, plus some quick-pickled beetroot. Step 1 For the smoked salmon filling, start by carefully removing the skin and setting it aside. Shred the salmon flesh coarsely and mix with mayonnaise, eschalot, herbs, lemon juice and black pepper. In a separate bowl mix the sliced beetroot with salt and sugar and lightly rub into the beetroot to soften and gently pickle. Leave to stand for four to five minutes. Step 2 For the crisp skin, heat grapeseed oil in a frypan and place the skin in the pan, scale side down. Place a small saucepan on top to ensure the skin cooks evenly and stays flat. Once golden on both sides (about two minutes), remove to a square of paper towel and season lightly with sea salt. Step 3 To assemble the sandwich, start by removing the bread crusts and place a generous spoonful of salmon mixture in the centre of the bread. Spread evenly. Add rocket and a few slices of pickled beetroot, followed by some of the crisp salmon skin and the second slice of bread, which has been smeared with a little hot mustard. Repeat with remaining ingredients. Serve immediately.